Airstrikes Move To Syria, Target More Than Just ISIS : The Two-Way The strikes, supported by five Arab nations, are a major escalation in the campaign and hit other extremist groups, including one that the Pentagon says is planning to attack U.S. interests. A photo released by the U.S. Navy shows the guided-missile cruiser USS Philippine Sea launching a Tomahawk cruise missile against Islamic State targets in Syria on Tuesday. In a major escalation of the air campaign against Islamic extremist groups, the U.S. and its Arab allies jointly hit targets inside Syria for the first time. The New York Times says, "The intensity of the attacks struck a fierce opening blow against the jihadists of the Islamic State, scattering its forces and damaging the network of facilities it has built in Syria that helped fuel its seizure of a large part of Iraq this year." Besides the U.S., the Pentagon says that Bahrain, Qatar, Saudi Arabia, Jordan and the United Arab Emirates "participated in or supported" operations against targets associated with the self-declared Islamic State. U.S. State Department spokesperson Jen Psaki confirmed that "we informed the Syrian regime directly of our intent to take action through our Ambassador to the United Nations (Ambassador [Samantha] Power) to the Syrian Permanent Representative to the United Nations. At a morning Pentagon briefing, Lt. Gen. William Mayville, the Joint Chiefs director of operations, said there were three waves of attacks, and that coalition partners provided combat air patrols and conducted airstrikes as part of the final two waves. "We warned Syria not to engage U.S. aircraft. We did not request the regime's permission. We did not coordinate our actions with the Syrian government. We did not provide advance notification to the Syrians at a military level, or give any indication of our timing on specific targets. Secretary [of State John] Kerry did not send a letter to the Syrian regime," Psaki said. -- The Islamic State in its Syrian headquarters of Raqqa. -- The al-Qaida-affiliated Nusra Front, or Jabhat al-Nusra, in northwest Syria. -- A shadowy group known as Khorasan that the U.S. says is planning an imminent attack against the United States and Western interests. NPR's Deborah Amos tells Morning Edition that militants with the Islamic State, also known as ISIS or ISIL, were a major focus of the attacks. 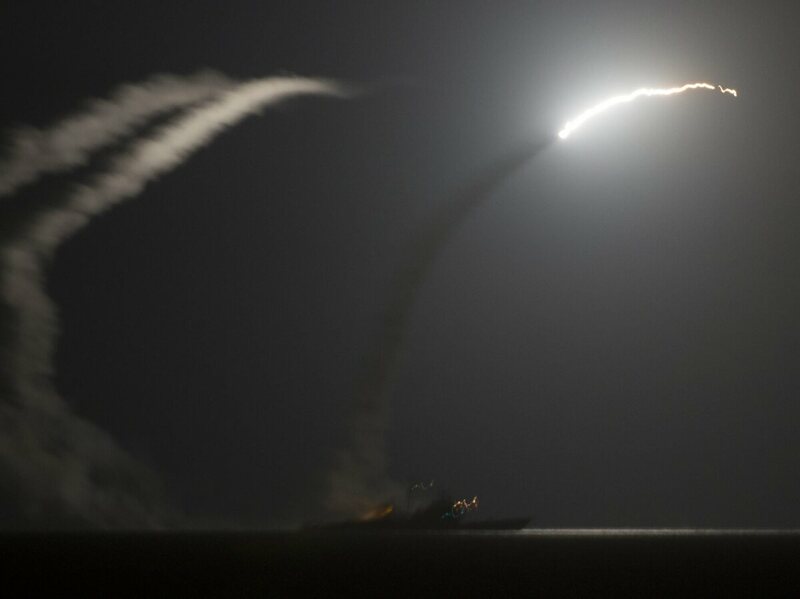 The Pentagon said the strikes "employed 47 [Tomahawk cruise missiles] launched from USS Arleigh Burke and USS Philippine Sea operating from international waters in the Red Sea and North Arabian Gulf, as well as U.S. Air Force, Navy and Marine Corps fighter, remotely piloted and bomber aircraft deployed to the U.S. Central Command area of operations." According to Deborah: "What is striking about this air campaign is that it was expanded to include the Nusra Front. "Those strikes took place in northwest Syria. The Nusra Front is an al-Qaida affiliate and has been at odds with ISIS. In fact, some of al-Nusra's fighters have been at war on the ground with ISIS, joining with more moderate groups against them." NPR's Tom Bowman says not much is known about the Khorasan group: "The Pentagon says they took this action to disrupt an imminent attack plotting against the United States by this group that's made up of seasoned al-Qaida veterans. There were eight strikes around Aleppo targeting this group. [The Pentagon says] it had training camps, explosives and munitions productions facility, communications building and also command and control facilities." Gen. Mayville said that "we've been watching" Khorasan and that the group "clearly is not focused" on fighting the Syrian regime of President Bashar Assad but instead had been "putting down roots" to work toward attacks on the U.S.
Mayville said in the first strike, which began about midnight Syrian time and involved mainly Tomahawk cruise missiles, the U.S. unilaterally hit Khorasan command and control in the country's northeast. The second wave employed F-22 Raptors in their first combat roles, as well as F-15s, F-16s and B-1 bombers, he said. The third and final wave against Islamic State militants in the east employed F-18 Hornets from the USS George H.W. Bush as well as ground-based F-16s, he said. Mayville said the majority of support from Arab allies came in the third wave. He showed journalists "before and after" bomb-damage assessment photos and video of various structures that had been hit. "There is almost no public information about the Khorasan group, which was described by several intelligence, law enforcement and military officials as being made up of Qaeda operatives from across the Middle East, South Asia and North Africa. Members of the cell are said to be particularly interested in devising terror plots using concealed explosives. It is unclear who, besides Mr. Fadhli, is part of the Khorasan group." The Wall Street Journal reports: "So far, more than a dozen airstrikes have hit Islamic State military targets and administrative buildings in Aleppo and Raqqa provinces in the north as well as al Qaeda's official arm in the country, al Nusra Front in the northwestern city of Idlib, the opposition said." Reuters quotes a resident in Raqqa as saying there is an "exodus" from the city in the wake of the bombardment. "It started in the early hours of the day after the strikes. People are fleeing toward the countryside," the resident tells Reuters. The participation of the partners "gives the operation some legitimacy — more legitimacy in the region because Arab governments took part. There [are] political optics about this operation put together in Washington," NPR's Deborah Amos says, adding that the agreement to participate "changes the stakes" for the Arab partners. The BBC's security correspondent Frank Gardner speculates that the Islamic State "will be enraged by this — it has no effective military answers to US air power — so those Arab countries that supported or took part in the action may well now be bracing themselves for possible reprisals." The Associated Press quotes Rami Abdurrahman, head of the Britain-based Syrian Observatory for Human Rights, as saying, "There is confirmed information that there are casualties among Islamic State group members." Speaking on MSNBC, Pentagon spokesman Rear Adm. John Kirby says the U.S. "is still assessing the effectiveness of these strikes." Later, Gen. Mayville said: "Last night's strikes are the beginning of a credible and sustained campaign to destroy" the Islamic State.